- Sleek Contemporary Design with Unobstructed Spectacular Sea and Port Views. - Two storied Villa with Private Garden, Luxurious Adult Accommodation, Unlimited WIFI. Situated right on the Award-Winning Scenic Coastal Walkway, in a quiet cul de sac, Kawaroa by the Sea encompasses the very best of holiday living. This two-storied villa welcomes you with a mix of restful white interior and warm timber features. From the moment you enter you will immediately be WOWED and feel the relaxed, beachy holiday vibe come over you. Level one on entry, greets you with high end lavished bedrooms with the very best of linen, a bespoke bathroom and a charming lounge area to relax in which opens out on to the garden. Head upstairs to the stunning main living area featuring a brand-new sophisticated kitchen with high tech appliances. This Villa seamless connects with the environment and blends perfectly with the sparkling bluewater view. 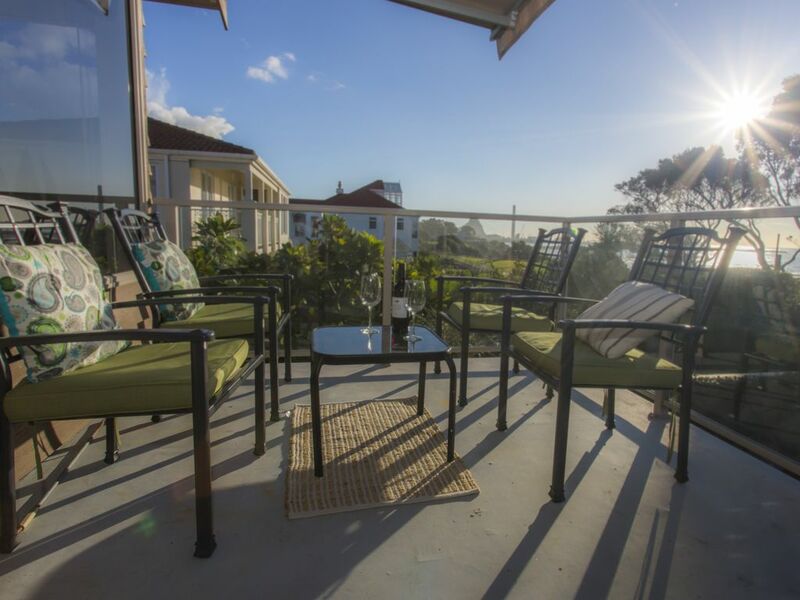 Relax on the balcony while watching the waves crash into the breakwater and soak up the expansive views of Partitutu rock and Port Taranaki. The Master Suite features a comfortable King Bed for a great nights sleep and sparkling high end ensuite. Park your car up you wont need it here. The Scenic Coastal Walkway will connect you to many of New Plymouth major attractions, take a 5-minute stroll to the Port where you will be spoilt for choice with various restaurants and cafes. Enjoy a mouth-watering breakfast at the Bach on Breakwater and head back to Gusto Restaurant in the evening to dine in style. Grab a takeaway at Catch & Co for the freshest fish in town. Spend your days at the NP Aquatic Centre 5-minute stroll or in the CBD for Arts, Culture and Shopping only a 10-minute stroll away. We like to ensure our guests are looked after while on holiday. All Bach Break properties come well equipped with cooking oil, salt, pepper, coffee, tea, sugar, milk, cleaning products, dishwasher tablets, dishwashing liquid, toliet paper, liquid hand soap and body wash. Quality linen & towels are provided for your stay. This property is an adult only retreat with high end quality living at its very best. When only the best will do Kawaroa by the Sea is for you.